The program was centered around the opening of a secret vault once owned by noted gangster Al Capone. The program is now perhaps best-known for the vault being ultimately empty except for debris. Al Capone was a Neapolitan born to immigrant parents in New York City who eventually moved to Chicago, Illinois. There he grew to become a notable criminal figure and gangster. He played large parts in gambling, alcohol, and prostitution rackets and in 1925 Capone took control of the Chicago Outfit for which he had served as the second in command, after an assassination attempt on former head Johnny Torrio. He was listed on the FBI's "Most Wanted" list, sold alcohol during the Prohibition era, planned the St. Valentine's Day massacre, and was eventually indicted and convicted of income tax evasion in 1931. 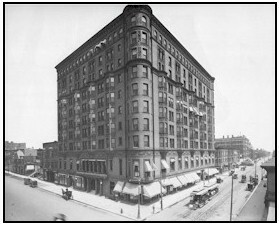 Capone had previously housed his headquarters at the nearby Metropole Hotel, but in July 1928 moved to a suite at the Lexington Hotel. Capone ran his various enterprises from this hotel until his arrest in 1931. A construction company in the 1980s planned a renovation of the Lexington Hotel and while surveying the building discovered a shooting range and a series of secret tunnels including one hidden behind Capone's medicine cabinet. These tunnels connected taverns and brothels to provide an elaborate potential escape route in case of a police raid. These discoveries led to further investigation of the hotel, notably by researcher Harold Rubin. Rumors said Capone had kept a very secret vault beneath the hotel to hold some of his wealth. Geraldo Rivera had been fired in 1985 after criticizing ABC for cancelling a report on an alleged relationship between John F. Kennedy and Marilyn Monroe. He then hosted the special, The Mystery of Al Capone's Vault, which was broadcast live on April 21, 1986. The two hour special (including commercials) was greatly hyped as potentially revealing great riches or bodies on live television. This included the presence of a medical examiner should bodies be found and agents from the Internal Revenue Service to collect any of Capone's money that might be discovered. When the vault was finally opened the only things found inside were dirt and several empty bottles including one Geraldo claimed was for moonshine bathtub gin. Despite the ending the special became the most-watched syndicated television special with an estimated audience of 30 million. Rivera later wrote of the event in his 1991 autobiography Exposing Myself that "My career was not over, I knew, but had just begun. And all because of a silly, high-concept stunt that failed to deliver on its titillating promise." The term "Al Capone's vault" has become slang for a heavily hyped event with disappointing results. When Geraldo Rivera cracked open Al Ca-pone's secret vault on live TV on April 27, 1986, America didn't know what to expect. Big Al's best silk boxers? His favorite baseball bat? An Eliot Ness dartboard? Anticipation was high, and Rivera, already renowned for theatrics as an ABC news reporter, played to the audience with trademark skill. 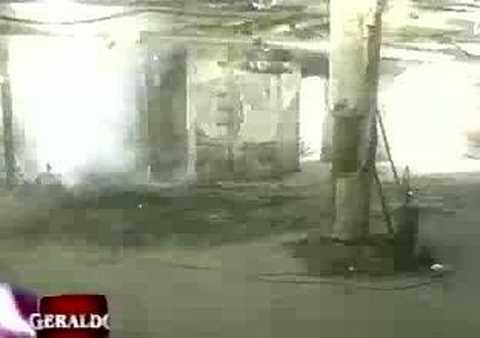 Standing in the basement of Chicago's abandoned Lexington Hotel, once the notorious prohibition-era gangster's headquarters and site of the vault, Rivera breathlessly proclaimed, ''This mystery is going to be resolved!'' Then he blasted away with a Thompson submachine gun and blew down a chunk of wall using a gangster-style dynamite plunger. But the payoff, alas, never came. After nearly two hours of frenzied buildup, with IRS agents and police crime-lab technicians standing by in case loot-or bodies-were unearthed, Rivera gathered his excavation crew around him, peered into the hole, and admitted to the folks at home that what he had turned up was pure dirt.